Show Pilates Exercises Free Here for You! Let me Show Pilates Exercises Free for You! If you are looking for someone to show Pilates Exercises Free for you then you have come to the right place! 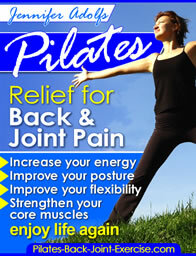 I have hundreds of pages of free Pilates exercises as you browse through my site. For now though, let me show you 5 of my favorite and the most effective at working the abdominals from all angles. I like to show Pilates exercises free on my website and this one is always popular because it helps to widdle the waist! It is a very effective exercise for getting rid of love handles and slimming the waist. Lying on a mat clasp your hands at the base of your skull. Keep your elbows wide by drawing the shoulder blades together and down. Bend your knees up into a table top position (knees directly over hips, shins parallel with the floor and toes pointed). Curl your head and shoulders off the floor just lifting to the base of your shoulder blades. Feel a fold or bow just under the chest. Draw in your lower abdominals, inhale in the center, then exhale as you twist at the waist bringing the right elbow to the left knee as you extend the right leg away from you. Switch elbow to right knee as you extend the left leg long. This oblique exercise works the deep core muscles, waist, arms, shoulders, thighs, and hips. I love to show Pilates exercises free because they are so effective at changing your body! Lie on your right side with your elbow bent at a 90 degree angle and forearm under your shoulder, fist points forward. Knees are bent at a 90 degree angle with legs and hips stacked. Draw in your lower abs and tighten your waist to raise your hip and thigh off the floor. Create one long line of energy from the crown of your head through your feet. Keep your shoulders pressing down away from the ears and hold for 6-8 seconds (build more repetitions as you advance rather than holding longer). Variation: For more challenge on this free Pilates exercise, extend the legs and raise your hips, thighs, and knees off the floor as you reach to the ceiling with the top hand. See these and many more detailed pictures and descriptions in my newly revised Pilates Ebook – Relief for Back and Joint Pain. I want to show Pilates exercises free for you, especially because this exercise is good not only for lumbar (low back) mobility, but also to stabilize the pelvis and work the deeper abdominal muscles. You will definitely feel the muscles of the abs, hamstrings, and gluteals when performing this exercise. From a neutral spine inhale to prepare and as you exhale imagine curling the spine up from the tailbone scooping out the deeper abdominals as the hips lift up to the ceiling. Feel your weight evenly in the shoulders and the feet to keep the hips lifted and level. Inhale at the top and then exhale to deeply peel the spine down from top to bottom. Repeat for 6-8 repetitions. 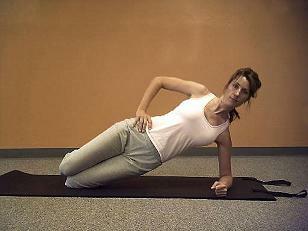 If you have to do crunches, then it is better to do them with one leg bent and the other leg extended on the floor. Doing crunches in this manner will reduce the loads on the spine. When I show Pilates exercises free I always like to include this one as it is very effective for people with a tendency for lower back pain. Lying on a Pilates exercise mat with your hands under the small of your back, elbows wide, and one leg extended and one leg bent. Slowly curl your head and shoulders off the mat feeling the fold or bow right under the chest. Just press your elbows down and don’t shrug your shoulders to cheat. You should feel the abdominal wall flattening and contracting. Repeat this Pilates ab exercise slowly to fatigue. This is a great way to stabilize the core (abdominals and back) while mobilizing the arms and legs for added balance. I like to show Pilates exercises free because they so effectively work the core muscles and balance that many of you are looking for. Kneeling with your hands directly under the shoulders and knees directly under the hips, assume a neutral spine by lengthening the spine from head to tail and activating the transversus abdominus (imagine a gem squeezed into your bellybutton and you don’t want it to fall out). Inhale as you slide one leg directly behind you and extending it up just parallel with the floor, once you are stable extend the opposite arm until it is parallel with the floor also. Hold, then exhale as you bring the arm and leg back to start at the same time. Repeat this free Pilates online exercise on the other side keeping the torso quiet and extended with the deep transverse abdominals engaged. Repeat this for 4-6 repetitions on each side. Leave Show Pilates Exercises Free and find out more about how Pilates exercises can benefit you.